Yin is in… …but what is Chi? “Chi” is equivalent to Prana, Spirit or Life Force. What it means is the energy we need to move, to keep up the basic bodily functions or defense systems. In Yin Yoga we repetitively talk about the Chi because it has an immediate connection to the meridians, the energy passages that nourish the vital organs, and the flow of the Chi through the body. But it is more than that. Influenced by Chinese Taoism, the word “Chi” is a broader concept. Is it the subtle force that moves the universe, found everywhere, in all inanimate and animate things. Everything contains Chi, for example our food, our breath, our body. Without Chi there wouldn’t be any life! Processed foods contains less chi than natural, unprocessed foods. A potato fresh from the field is full of Chi whereas potato chips which have been processed in a factory have nothing left of this beautiful energy. Chi that flows through the human body has various sources. Some Daoists have discovered 32 different kinds of Chi! One way to acquire Chi is to give it to the baby when it is born (Yuan Chi or Original Chi), the Chi from both parents flow together and is being forwarded to the unborn in the womb. Another way is to receive Chi from our food (Gu Chi or Grain Chi), a healthy diet. The fresher, more natural and nutrient our food is, the more Chi we provide for ourselves. Or we breathe in the Chi (Kong Chi). If the air that is surrounding you is clean and we breathe in deeply into our lungs with each breath we take, more Chi is entering the body. When we sleep we produce Chi energy with our deep breaths. This, besides many other reasons, is why a regular sleep is so important for one’s regeneration. Chi is also being produced by modest movements, meditation and relaxation exercises. Yin Yoga plays an important role in this scenario. In the long held postures we create an accumulation of Chi, hindering its flow. The accumulated amount of Chi then moves into the connective tissue networks until we release the position. What happens is similar to a dike in nature: all the Chi rushes through the meridian, improving the supply of Chi in the vital organs (Ying Chi or Nourishing Chi) and removing blockages. Benefits: Opens the hips, groin. Provides a gentle opening to the inner knees. Stimulates the ovaries. Contraindications: A strap helps to avoid too much stress to the inner leg lines. Stimulated Meridians and Organs: Liver, Kidney and Spleen. Hold for at least 3 minutes, up to 8 minutes. Releasing the pose: Inhale the legs back up together. Bend the legs into the chest and lower both knees down to the side. Take your time to release and feel the sensations of Chi! 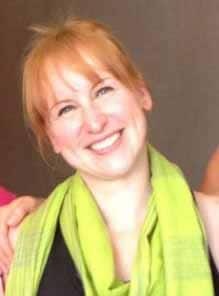 Nicole Schulz, SOYA, E-RYT200 and RYT-500 specialized in Yin Yoga with 85 hours of training with Bernie Clark. “I teach for the love of teaching, from the heart.” You can also check out her personal webpage www.nicole-yoga.com . By Jools Andrés, SOYA, E-RYT200, RYT500. To overcome our troubles it is helpful to become aware of all five kleshas and how they can play out in our own lives. Nearly all of us identify most strongly with our temporal surroundings. Our conditioning in this regard is deep and strong and can manifest in yoga practice and teaching by focusing primarily on the physical effects of asana. This can (and often does) make us hold yoga in a confined, even confused conceptual space. The distortions we form on the physical level filter through to the mental and spiritual levels and obstruct us from blossoming fully as practitioners of yoga’s eight limbs, as outlined in the Yoga Sutras, and create stubborn roadblocks on our journey toward becoming enlightened beings. This condition of ignorance is also the source of the remaining four obstacles. As you continue on with your day or evening after reading this, pay attention and see if you can notice three or four things that you are quite attached to or attracted to as they arise. Most often these things provide pleasure or reassurance of some kind, so we tend to return to them repeatedly, sometimes even mindlessly. It could be that you are fiercely bound to the routine of your day¾do you feel anxious or even paralyzed when something happens that upsets the usual course of events? You may notice a habit of consumption such as having a glass of wine, comforting yourself with a certain snack, or turning on the TV at a regular time. “Passions,” obsessions, addictions¾all have a way of overtaking us and diverting us from our intentions. Once we become aware of these habitual attachments we can make progress toward keeping them in check. This klesha is often translated as “fear of death.” This may be because underlying all of our dreads is the fear of not completing what we want to do in our lifetimes. Whether it is a leaving a body of creative work, helping to improve the lives of others, amassing a valuable estate, or seeing our friends and family one more time, there is always more to achieve, always something that causes us to believe that our lives are perpetually unfinished. This misconception leads us right back to ignorance and primary identification with our existence on the physical plane. Observing our thoughts and behaviours and taking positive steps to temper our responses leads us to develop consciousness of and confidence in our true, innermost selves. Our fears eventually, certainly, melt away over time as this faith grows. [i] The Yoga of the Bhagavad Gita, Paramahansa Yogananda; Self-Realization Fellowship, 2007, Los Angeles, CA, p. 40. [ii] The Essence of Yoga: Reflections on the Yoga Sutras of Patanjali, Bernard Bouanchaud; Sri Satguru Publications, 1997, Delhi, India, p. 82. [iii]Yoga: The Spirit and Practice of Moving Into Stillness, Erich Schiffmann; Pocket Books, 1996, New York, NY, p. 322. [iv]The Radiance Sutras: 112 Gateways to the Yoga of Wonder & Delight, Lorin Roche; Sounds True, 2014, Boulder, CO, p. 171. ©Julie (Jools) Andrés, 2015; used with permission.